Amanda, a 30-year-old who smoked during pregnancy, gave birth two months early to a baby girl who had to spend weeks in an incubator. Sadly, Amanda is not alone; according to a 2014 surgeon general’s report on the health consequences of smoking, at least one in 10 women smoke during the last three months of pregnancy. 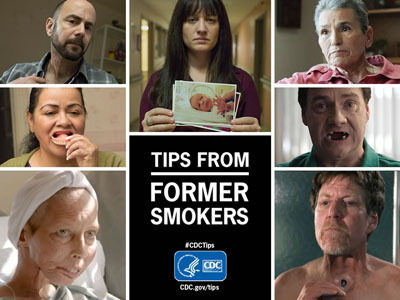 This is just one of the many powerful stories featured in the hard-hitting advertisements of the Centers for Disease Control and Prevention’s 2014 “Tips from Former Smokers” campaign. The ads, launched July 7, will run nationwide for nine weeks on television, radio and billboards, online, in theaters, magazines and in newspapers. The campaign profiles real people who are living with serious long-term health effects from smoking and/or secondhand smoke exposure. Since the first set of “Tips” ads launched in 2012, the campaign has been extremely successful. Last year, the average weekly number of calls to 1-800-QUIT NOW — a number that links callers to their state quitlines — increased by 75 percent, and the number of visitors to the campaign’s website increased by 3,700 percent. In Sept. 2013, The Lancet medical journal published the results of the 2012 campaign, which indicated that an estimated 1.64 million Americans tried to quit smoking because of the campaign, and at least 100,000 smokers are expected to quit for good. Tobacco prevention and cessation continues to be a huge challenge in the U.S. The launch of these latest ads comes as CDC releases new data on how many U.S. adults use some form of tobacco. According to CDC’s National Adult Tobacco Survey, more than one in five U.S. adults uses some form of tobacco regularly. Smoking remains the leading cause of preventable death and disease in the United States, killing more than 480,000 Americans each year. And for every smoking-related death, at least 30 Americans live with a smoking-related illness. Visit the “Tips” campaign online to view the personal stories from the campaign. The website also includes detailed assistance developed by the National Cancer Institute to support smokers trying to quit.